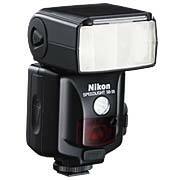 It is popular to house a land flash for underwater photography. Land flashes offer the ultimate dedication with housed cameras and can therefore allow you to take advantage of all the advanced features available to your camera system. Some flash housings do not support the advanced functions. Tubular designs of flash housingA casing or box with waterproof seals designed to contain a camera or other equipment in such a way that it can be used underwater. offer least functionality (because the flash must be opened out straight - a position which is reserved for land bounce flash and so automatically disables pre-flashMany digicams employ a slightly different system for TTL exposure. First they fire a pre-flash which is measured and they calculate exposure based on that. This happens so quickly that the eye notices only one flash. and Balanced Fill flash). Only clam shellA housing that splits longitudinally down the middle, cast aluminum housings allow the (Cobra head) flash to remain in the bent over position with no loss of functionality. Such housings are more expensive (as much work goes into them as a camera housingA casing or box with waterproof seals designed to contain a camera or other equipment in such a way that it can be used underwater.) and more cumbersome. Whichever flash housing you choose, it should (as a minimum) allow you to switch it on (and off for natural light shots) underwater.